Since I became the subject of a post over at Mets blog Toasted Joe's yesterday, I felt obligated to return the favor today in my title. Maybe a few of you recall a post I wrote last season after John Maine completely baffled the Cubs offense the first time he ever faced him. So mystified were the Cub batters that I likened it to having a centaur pitch to them. Well this season Uncle Lou is here, and Uncle Lou was quick to point out that centaurs don't really exist, and neither does Santa Claus, Sidd Fynch or Eskimos while we're at it. The Cubs responded by ripping Maine for 7 hits and 3 runs in 5 innings. Then in came Scott Schoeneweis who proceeded to load up the bases with one out. Bases loaded? One out? The Cubs are bound to get some runs right? RIGHT? Len and Bob were quick to point out the Cubs 0 for 182 slump this season with the bases loaded, which is followed by Soriano popping out. Speaking of Soriano, he's now 1-8 batting in the 3 spot for Derrek Lee. Come on Fonz! Can we just trick him into thinking he's really hitting leadoff? Anyway, so now the bases are loaded with 2 outs and it looks like yet another opportunity squandered, when suddenly Aramis Ramirez crushes a grand slam. I'm not sure but I think it may have landed in the future Shea Stadium. Actually I believe it's going to be called Citi Field, which should provide angry bloggers plenty of opportunities to pronounce it as something else. So the Cubs put up 10 runs for Chaz, which unlike most of his other performances this season, he didn't really need as he allowed only 1 run on 6 hits over 8 innings. With Derrek Lee out, Chaz also felt we needed to even things up by taking out their 1B Carlos Delgado, who took a pitch right off his hand and left the game in the 7th. If he misses any time, 68 year old Julio Franco will fill in, so long as the game doesn't interfere with bingo and the early bird special at Old Country Buffet. Cliff Floyd made his official return to Shea since leaving the Mets, starting in right field, which meant no Thunder Matt. I'll say it again, I'd love to see Murton starting every day, but when Corny Floyd is hitting the way he has, how can you really be all that upset? With the Fonz batting third, we were treated to The Riot at leadoff, and he didn't disappoint, going 1 for 3 with 3 walks as well stealing his seventh base of the season. This guy really needs to be our leadoff guy with Soriano, Lee, and Ramirez as the 3-4-5. Mike Fontenot saw some action too. Mike was the winner of the Fifth Third Bank "Play a game with the Cubs" sweepstakes. The kid even got a base hit. Actually Mike has been hitting extremely well in AAA and got called up since Mark DeRosa is battling injury. Another recent call up who's a little more familiar, Angel Pagan also got a pinch hit. Apparently Pagan was once a young prospect for the Mets organization. I did not know that. I always thought he was discovered by a Cubs scout who only seeks guys with unusual names (Rocky Cherry, Buck Coats, Felix Pie). Kind of like your buddy who mails in the final few rounds of your fantasy football draft and picks guys like DeMarcus Faggins, Yo Murphy, and Taco Wallace because the names make him laugh. Also I saw that Fontenot got #17. Really? I realize Grace's number isn't retired but can't we find a different number to give these callups? Anyway Fontenot went to LSU, which I would assume means he was teammates with The Riot. Rich Hill will take the mound tonight. Hill has only faced the Mets once before, back in 2005 in Shea. 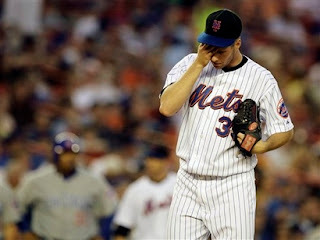 Hill was shellacked, giving up 7 hits and 7 runs, and only lasted 1 1/3 innings before being yanked. However, that was then. Our little Richie is all growns up now. I'm banking he pitches better. Unfortunately this has the makings of one of those classic games where they follow up a 10 run performance with a complete offensive shutdown, and Mets pitcher Jorge Sosa has all the makings of being a new mythological beast to shut them down.